From excavation to appliance troubleshooting, gas and oil crews must be prepared for a range of tasks in the field while contending with weather extremes, a 24/7 service cycle and the hazards of handling volatile material. Staying safe and meeting service goals in that environment requires a truck as tough and versatile as its crew. Gas and oil companies trust Reading to provide the range of capabilities and durable components their crews need to be safe and efficient in the field. The SchagrinGAS Company is one of the largest family-owned propane companies in the U.S. The company runs a fleet of twenty F-450 and F-350 chassis upfitted with 11’ Reading Classic II service bodies, Reading lift gates and IMT cranes. Nine of the trucks are propane-powered. Service is one reason why Andrew Levinson, president of SchagrinGAS, selected the Classic II service body. “We have always dealt with Reading directly, especially since we take a Reading Classic II body and have custom work done to add pipe racks, lift gates and cranes,” Levinson says. 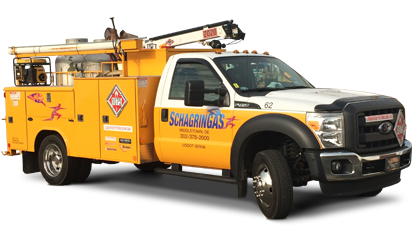 SchagrinGAS typically works through their local commercial truck dealer to obtain a chassis at same time they coordinate the truck body and upfit. The 11’ Classic II service truck body provides a wealth of organized storage options and an extended cargo area, while the lift gate allows safe, easy loading and unloading of heavy equipment and propane tanks. Add Reading’s quality craftsmanship and you have a versatile, rugged all-around truck service truck for gas and oil field work.